Synopsis: Ten years ago Kate Winters’ parents were taken by the High Council’s wardens to help with the country’s war effort. Now the wardens are back...and prisoners, including Kate's uncle Artemis, are taken south on the terrifying Night Train. Kate and her friend Edgar are hunted by a far more dangerous enemy. Silas Dane – the High Council’s most feared man – recognises Kate as one of the Skilled; a rare group of people able to see through the veil between the living and the dead. His spirit was damaged by the High Council’s experiments into the veil, and he’s convinced that Kate can undo the damage and allow him to find peace. The knowledge Kate needs lies within Wintercraft – a book thought to be hidden deep beneath the graveyard city of Fume. But the Night of Souls, when the veil between life and death is at its thinnest, is just days away and the High Council have their own sinister plans for Kate and Wintercraft. Wintercraft is publisher Headline’s latest young adult fantasy novel, and they’re selling it as a dark and secretive adventure. They’ve said that it’s to is ‘set to be the most exciting teen title of 2010’, and in away, it is exactly that. The cover itself is eery and fascinating, and to my mind it reflects the story, at least the second half, very well. And although it is perhaps not the most exciting book of the year, it is certainly up in the top few. The prologue immediately shows us what to expect throughout the book. It’s a great first chapter because it’s very dark and secretive, and it immediately gets you intrigued about the story. It’s a shame that as soon as the prologue is finished, this dark secrecy is immediately forgotten, and the following chapters are far less fascinating to read about. It is perhaps paced slightly to slow for what it pertains, and while it certainly isn’t awful, it isn’t that great either. It’s only when we are into the second half of the book that we return to the great secrecy that we saw in the prologue, and this time it’s for more than just one chapter. After the transition, the thrilling and strangely exhilarating read doesn’t stop before the very last letter, and we’re left with hardly a breath to spare. If it’s only for this climax it is worth reading Wintercraft. But what really makes Wintercraft so deliciously dark is the world it is set in. Jenna Burtenshaw has made a fascinating universe where death plays an intricate part of everyday life. She has created a fascinating way of portraying death, too; her portrayal is certainly one of my favourite ways an author has ever used the idea of death centrally to a story (Tolkien’s Lord of the Rings is another great example). The ideas and world-building described in Wintercraft are great, and Jenna Burtenshaw has come up with some great concepts which work a treat with the other ideas shown in the book, and although there are perhaps a few similarities to other books, I found them abstract enough that it never really bugged me. When, or if you read Wintercraft, you’ll probably notice that the characters aren’t the greatest you’ve seen in a novel. Some of them aren’t that original, and while this might be a problem for those who wish every character to be new and unique, for most of us it won’t be such a problem and we’ll soon get carried away with the story and the world it is set in. 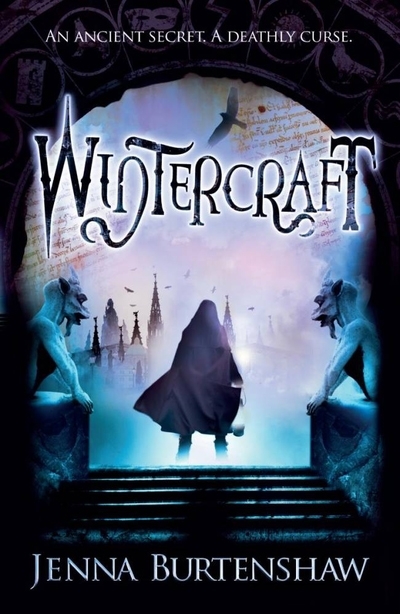 Sometimes the dialogue can be quite stiff and unnatural (I found this to be the case particularly with one character, which was odd), this is no huge let down, and for a debut novel, Wintercraft is still very enjoyable. The descriptions are cinematic, and the writing seems to hold an atmosphere of dark tension and fascination, and this is undeniably what will attract most of the readers. In a way, Wintercraft is a far more visual novel than many, something that would be quite easy to translate into film format, and boy would I love to see a film adaptation of this. If done correctly, a Wintercraft film could look and feel stunning, as well as being a captivating story.